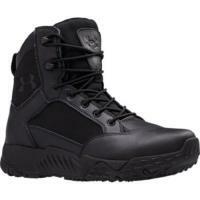 Move further and stay standing longer while wearing the Women's UA Stellar Tactical Boots produced by Under Armour. Featuring a minimalist design that does not sacrifice strength or durability, these boots have what it takes to keep on duty professionals on their feet and comfortable no matter how long the shift. A quick-dry design, combined with a tough DWR finish and Under Armour's patented storm gear technology repel water for dry feet no matter what the environment. The rubber lug sole delivers superior traction on virtually any surface, while the molded EVA midsole offers crucial arch support to eliminate foot fatigue. A reinforced TPU shank provides additional support so that wearers can easily make quick turns and stop on a dime. Leaving no detail over looked, the upper is composed of a combination of leather and 900D nylon to create comfortable, lightweight fit. The boots run true to size. You can return it for exchange or refund if you are not satisfy with the fit.